A college football tradition that often determines the fate of conference and national championship possibilities. While the discussion this late in the season is often centered around who’s going to the playoff or different bowl game scenarios, it’s also often Senior Day on home fields across the nation. Players who’ve given four or sometimes five years to their program are celebrated. Since we at Pro Football Focus grade every player on every play of every game, we are best suited to inform you on something unique about each player, and this year’s crop of seniors have a full career’s worth of PFF data to their name. Thus, as we give one final look at last week by outlining an interesting observation pulled from PFF’s wealth of college data, our Top 25 Observations series focuses this week on the team’s senior leaders from the PFF Top 25 and something unique about their season, and in some cases, career. PFF’s Top 25 Observation series is brought to you by Eckrich, the Official Smoked Sausage of the College Football Playoff. The senior edge defenders have saved their best for last in 2018. Miller has been often injured in his career but has been on the field this season (360 snaps) more than the previous three seasons combined (207) and Buggs has put in two productive seasons after transferring from junior college. In 2018, the two have combined for 60 total QB pressures (including 21 sacks) and 33 stops. Wilkins let the NFL wait another year and is producing the highest-graded season of his career. He has the third-highest grade among interior defensive linemen, only behind two potential first-round picks in Alabama’s Quinnen Williams (95.9) and Houston’s Ed Oliver (93.4). His run-stop percentage (13.7) is second only to Williams and he’s tied for seventh among with 32 total QB pressures and 30 stops. 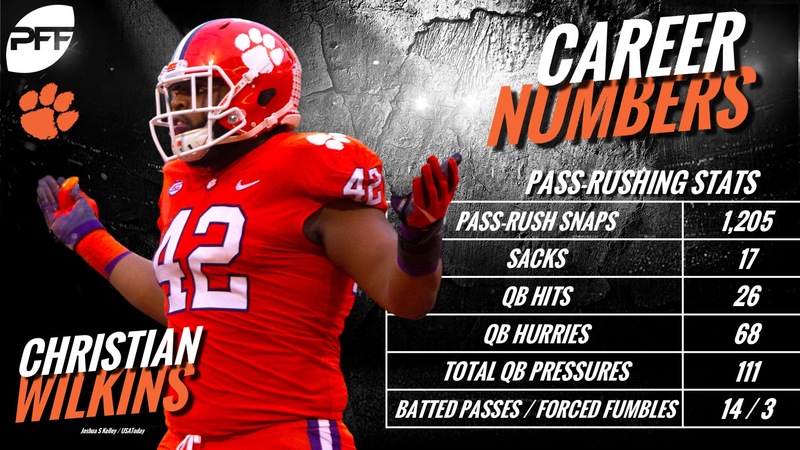 In his career, Wilkins has logged over 2,200 snaps and produced 111 total QB pressures and 111 stops. Earlier this week, PFF’s Mike Renner highlighted some names to know for the upcoming draft, which included the Fighting Irish’s senior leaders in Coney and Tillery. Both have improved their grades each season and, like Alabama’s senior duo above, are saving their best for last. Coney is currently the second-highest graded linebacker and Tillery the 10th-highest graded interior defender. While senior cornerback Deandre Baker is and has been our highest-graded corner this season (90.9), the senior defensive linemen above have added more veteran presence on what is the youngest team in SEC and one that has only seven seniors total on their two-deep on offense and defense. While the Bulldogs’ lack of a pass rush has been discussed, Ledbetter and Walker have provided the most consistent pressure as their 41 combined total QB pressures account for 30% of the Bulldogs 135 as a team. Defense has obviously not been the Sooners strength in 2018, but Bolton is finally healthy and getting a chance to contribute in his final season in Norman. Bolton leads the Sooners defense in grade, snaps (676) and stops (43) and also has 17 total QB pressures on only 62 pass-rush snaps. While Winovich’s status for the game of the weekend against Ohio State is still in doubt after an injury last week, the fifth-year senior has put together a stellar career for the Maize and Blue. Our current 14th-highest graded edge defender, Winovich was also the sixth-highest graded edge player in 2017 (90.5 grade). In his 1,500-plus career snaps, Winovich has 131 total QB pressures and 101 stops as well as only eight missed tackles. The offensive side of the ball tends to get the headlines for the Knights, but senior outside linebacker Titus Davis, along with sophomore safety Richie Grant (89.7), have led a defense that has made plays when necessary and dominated Cincinnati last week. Davis has improved every facet of his game in his final season, already posting a career high in total QB pressures (31) and stops (28). His seven total QB pressures, including three sacks, against Cincinnati last week were both single-game career highs. 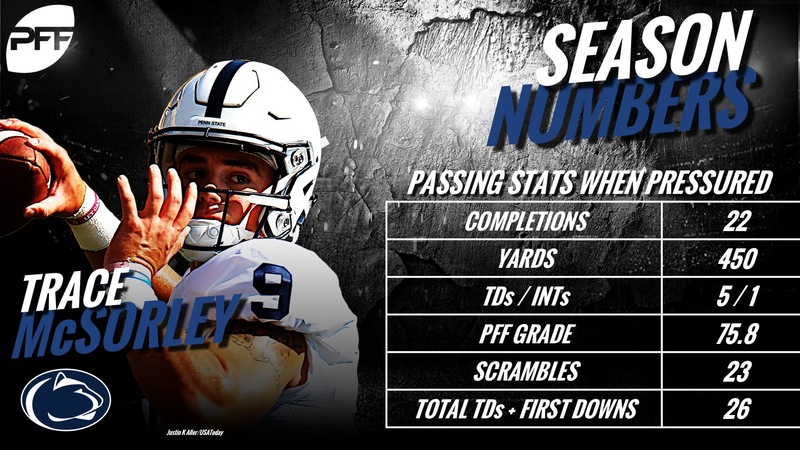 Penn State’s rise to a consistent top 10 program under James Franklin also happens to coincide with McSorley’s reign as the Nittany Lions quarterback. McSorley has logged nearly 2,500 snaps over the past three seasons and performed at a high level in doing so. Drops have plagued them in 2018, as 30 Penn State drops on McSorley passes are second most in the FBS and McSorley’s 9.8 drop percentage is the highest among FBS QBs. McSorley has done a great job of taking care of the ball as well, as he is one of only three FBS QBs with over 50 attempts under pressure without a turnover-worthy throw. The senior’s production has matched his speed and ability in 2018, with career highs in receptions, yards and touchdowns. Campbell has used that speed to do most of his damage after the catch, as 561 of his 719 yards (78%) have come after the catch. Those 561 yards are the seventh-most in the FBS and his 133.1 passer rating when targeted is 23rd. Currently our seventh-highest graded quarterback, Rypien has put together a stellar career on over 3,100 snaps and is posting a career-high passing grade (90.3) in his final season leading the Broncos. Rypien and the Boise State offense takes deep shots, and is successful, as much as any team in the country. He is seventh in yards on deep passes and first in touchdowns on deep throws with 19. In addition, no one has made as many big-time throws in 2018 as Rypien and North Texas’ Mason Fine (29). A three-year starter for the Cougars, Dillard has logged over 3,100 career snaps. On almost 2,400 pass blocking snaps, Dillard has allowed only 75 total QB pressures. In 2018, Dillard has the third-highest pass-block grade among tackles (93.2) and his pass-blocking efficiency of 98.8 is the 11th-best among tackles. After logging only 88 snaps in his first three years in Baton Rouge, Brossette has stepped in and stepped up in his senior season. His 13 touchdowns are the 10th most in the FBS and he has done a lot of his damage on his own, as 549 of his 862 yards (64%) have come after contact. Another three-year starter, Davis has been a consistently strong performer in the middle of the Tigers defense. His current grade is a career high and, in 2018, his 13.7 run-stop percentage is 10th among LBs. In addition, Davis’ 25 tackles for loss or no gain in first in the FBS among linebackers. Our sixth-highest graded linebacker, Burr-Kirven leads a talented Huskies defense. Kirven also has the fourth-highest tackling grade and fifth-highest coverage grade. 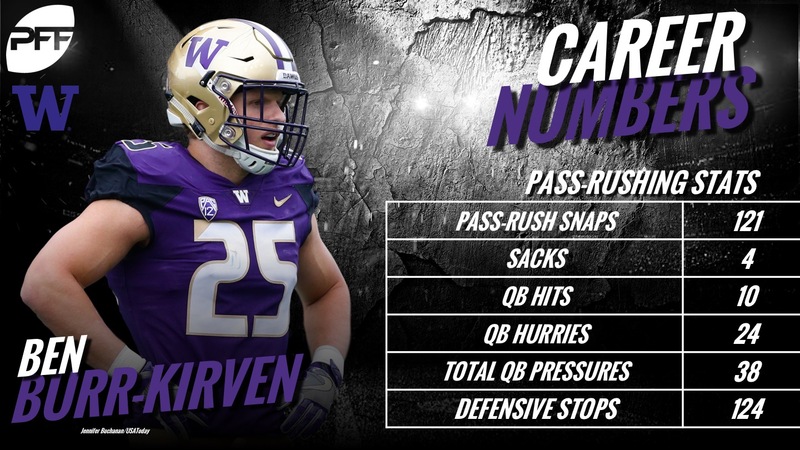 Burr-Kirven has 47 stops and, though he’s often in coverage, he has been effective when asked to rush the passer, collecting 15 total QB pressures on only 37 pass-rush snaps. A multi-season starter for the Longhorns, Boyd is producing the highest-graded season of his career. He’s only allowed 36 receptions on 72 targets and his 18 forced incompletions are the fourth-most in the FBS. After initially beginning his career at Michigan State, Sweat has now put together back-to-back strong seasons to finish his career in Starkville. In the past two years, Sweat has 80 total QB pressures, including 22 sacks and 61 total stops. This season, his 19.5% pass-rush win percentage is 17th among edge defenders. After spending two seasons at Oregon State, McMaryion has flourished at Fresno State. His 122.9 passer rating from a clean pocket is 10th in the FBS. In addition, he has been extremely accurate, as his 78.9% adjusted completion percentage is fifth in the FBS. Coinciding with that accuracy has been the ability to avoid turnover-worthy plays. Like McSorley above, McMaryion has yet to have a turnover-worthy throw when under pressure. Earlier this season we highlighted Utes senior LB Chase Hansen (84.1) in our Top 25 Observations series. Thus, today we examine his teammate and fellow senior standout Barton. Tied with Hansen for the team lead in tackles, Barton also has 38 stops and 17 total QB pressures in 100 pass-rush snaps. In his over 1,600 career snaps, Barton has 78 stops and only 10 missed tackles. A safety earlier in his career, Pratt has transitioned to linebacker over the past two seasons, with this being by far his highest-graded season and most snaps played. Pratt is currently the 15th-highest graded linebacker and also has the eighth-highest tackling grade, with only four missed tackles and 43 stops. Additionally, Pratt has the fourth-highest pass-rush productivity (16.9) among LBs, with 22 total QB pressures in only 69 pass-rush snaps. 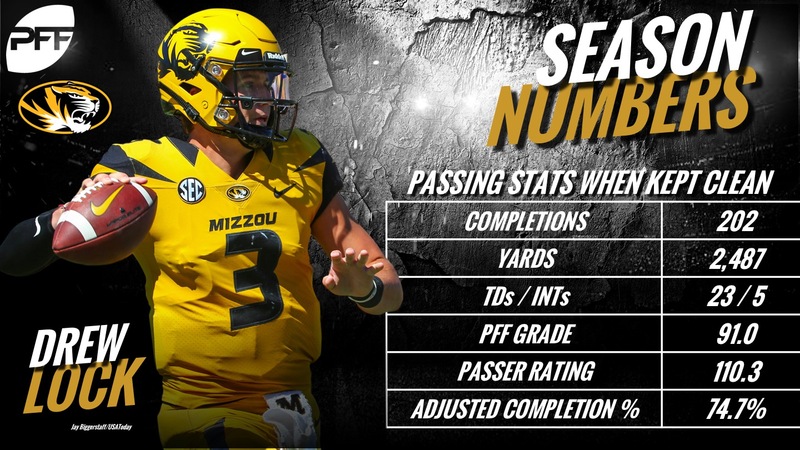 A true four-year starter, Lock has logged over 3,100 snaps as Missouri’s quarterback, with 2018 being his highest-graded season as well. Lock has been especially good from a clean pocket this year, posting a 91.0 grade and throwing 23 touchdowns when not pressured. Further, Lock’s 26 big-time throws are the fifth-most in the FBS. Since losing to Oklahoma in overtime, Army has run off seven straight victories to get to 9-2. Led by their youth, Army only has two seniors on their two-deep roster, one being the three-year starter in the middle in Holland. Holland is saving his best for last as well, with career highs in overall, pass-blocking and run-blocking grade. While Army does not throw the ball too often, Holland has only allowed two QB pressures on 88 pass-blocking snaps. Another senior having a career-best season, Thompson is currently our 17th-highest graded interior defensive linemen. A three-year starter for the Wildcats, Thompson also has career bests with 21 total QB pressures and 13 stops. Thompson’s play will be vital if the Wildcats want to win their first outright Big Ten championship since 1995. A starter the past two seasons for the Mountaineers, Flory and junior safety Desmond Franklin lead a team and defense that has won eight of nine since almost upsetting Penn State in the opener. Flory leads the team with 41 stops and has six total QB pressures on just 24 pass-rush snaps. Gervase is coming into his own in his second season as a starter and excelling in his final season as a Hawkeye. Among qualified safeties, Gervase’s 41.1 passer rating allowed into his coverage is the 17th-best, as he’s only allowed nine receptions on 20 targets for 117 yards. In addition, he has three interceptions and four pass breakups. While the team’s season has not gone as they have wished, Edwards and Connelly have been stellar for the Badgers defense. The two are the only combination of linebackers in the top 20 in terms of overall grade as Edwards is the 12th-highest graded and Connelly the 19th. The two have almost 3,500 snaps between them and this season have combined for 93 stops and 32 total QB pressures on only 99 pass-rush snaps.